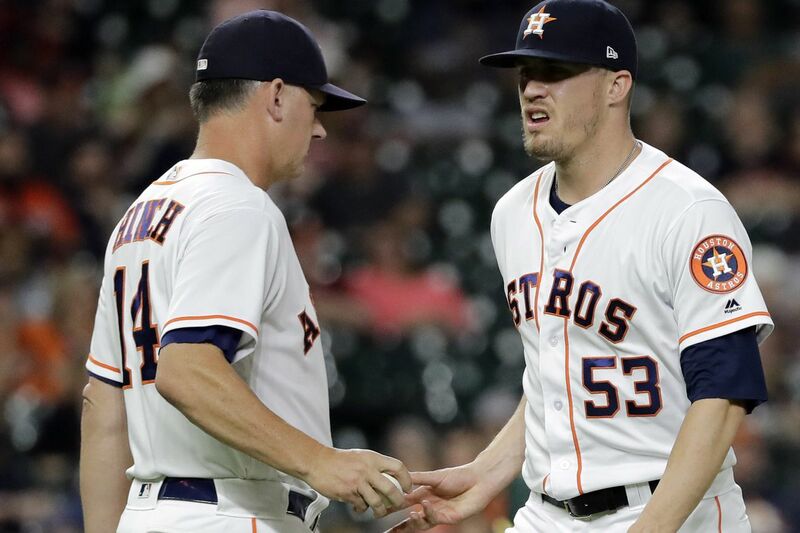 Houston Astros manager AJ Hinch (14) pulls relief pitcher Ken Giles (53) on Tuesday. The demotion comes as Giles' poor season continues. The late reliever that the Phillies traded in 2015 for a package that included Vince Velasquez had given up 36 hits and 17 earned runs over 30 2/3 innings this season with a 4.99 ERA. He tallied 12 saves in 34 games pitched, but lost his role as a closer last month. With the Phillies, Giles struck out 151 batters in 115.2 innings, allowed just 20 earned runs over that time and finished fourth in rookie of the year voting his first season. Giles had issues with outbursts after rocky outings this season. It appeared that Giles had some choice words for Astros manager AJ Hich after getting pulled from last night's game against the Athletics. Giles' most notable example of losing control of his emotions came when he punched himself in the jaw earlier this season.